You... Draw them so cute OMG, I love them... 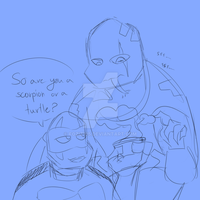 Though I haven't watched all the chapters from ROTTMNT cuz I'm lazy, they're so funny! I also love that you've made the dark version of them(?? Eyy glad you love em!